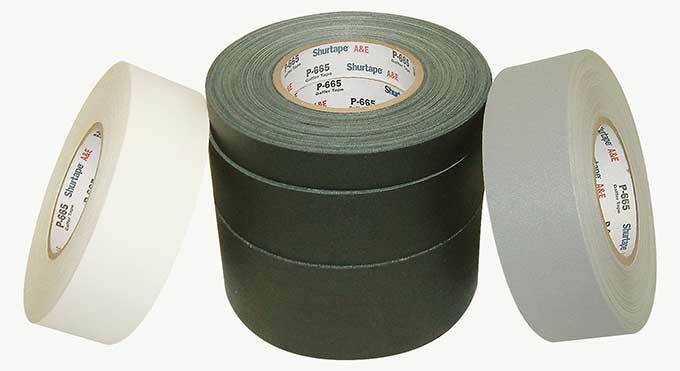 If you think duct tape is useful, try Gaffer’s tape, known by the brand Permacel (P-665). It’s the standard film industry tape. Easy to rip with your hands yet very strong. The adhesive is designed to not rip off paint. My film teacher stuck some on the school wall and left it sit for the whole day under a kilowatt of light a few inches away. The next day it peeled right off leaving the paint on and no adhesive residue. Standard practice is to roll smaller amounts of the tape off onto a film core for use during the shoot. It comes in many colors and is easy to write on. Uses include sealing film cans and labeling them, marking spots on the floor for measuring, labeling of all kinds. This stuff is really strong. I’ve heard it referred to as “hundred mile an hour tape” used by NASCAR racers. Also nice is that it comes in a one inch width which I usually have to rip duct tape in half to get. Comes in 2″, 3″ and 4″ widths as well. Another tape, P-672, is about double the price of P-665 but is weatherproof, twice as thick, and the adhesive is designed for low temperatures. It’s the real Gaffer’s tape. Sealing in the cold is important as film cans generally get refrigerated or frozen.